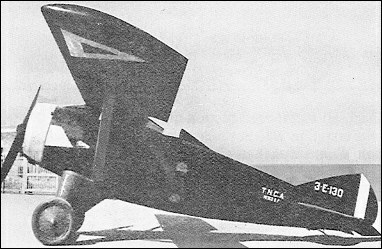 Following the appointment of Ing Angel Lascurain y Osio as director of the TNCA in 1920, several original designs were developed by this organisation, including, in 1924, a single-seat fighter for the air component of the Mexican Army. Known as the 3-E-130 Tololoche (a colloquial name for a type of guitar) and designed by Antonio Zea, this was a parasol monoplane of wooden monocoque construction powered by a 160hp Le Rhone rotary air-cooled engine. Apart from the engine, all elements of the Tololoche were of Mexican origin, the structure being primarily of spruce with three-ply veneer skinning. A batch of four fighters of this type was built. I too would like to model this airplane. Interested in any 3 views, photos, documentation, etc. You know, this is a VERY aerodynamically clean aircraft! At least for the day. A single center wing strut, no bracing wires I can see... very nice! Do you know the name of the Mexican Pilot that may have flown this aircraft under a famous arch in Mexico City and also escorted Lindberg while he visited Mexico? So this would make it accross the river to Texas without getting your feet wet. How cool was that?? Hey!! !.I�am mexican.�The E-130 was participed in WWII as scout plane? It is a pity that the Mexican Government, at the request of the European & American (USA) Powers. There were excellent designers at that time in Mexico. Funny thing that now Mexican Aviation Industry might reflourish under the shadow of the Canadianas of Bombardier.